Is your home ready for this year’s winter in PA? If not, let us show you what to do to save energy! How do I get my home ready for winter in Pennsylvania? As winter comes and the temperature drops, it’s time to break out the heaters. The U.S. Energy Information Administration expects that “average household bills for most major energy sources of home heating will rise this winter because of higher forecast energy prices.” So what can you do to stop your energy bills from rising as well? 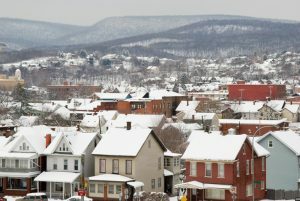 Let’s take a look at five ways you can cut down on your energy rates this winter in Pennsylvania. 1. Have your furnace serviced professionally. Making sure your heating system is clean and working properly will ensure you’re not wasting money on a furnace that’s not working to its fullest potential. Most heating systems last 12 to 15 years on average, so make sure yours is checked and in working order. Dirty air filters can clog and should be replaced every three months; monthly if someone smokes or if there are pets in the home. A great idea is to install a programmable thermostat. According to the U.S. Department of Energy, this can save an estimated 10% a year on heating and cooling costs. 2. Clean out your gutters. During autumn, fallen leaves can build up in gutters if not cleaned out. This leads to clogging and, when winter comes, ice dams can form that prevent drainage systems from working as they should. When an ice dam forms, ice can work its way under shingles into the roof. When melting water seeps down underneath the roofing and down into ceiling and exterior walls, it can cause severe damage. In some cases, it can even pull the gutters off and cause further damage to anything they fall on. Prevent damage by cleaning those fallen leaves out now and help save money on your electricity bill. 3. Insulate and caulk your windows and doors. By reducing the amount of air leaking from your home you can save up to 10% on heating costs and improve comfort throughout the cold winter months. This can be done with caulking and weatherstripping. Caulk and seal cracks and openings around window frames, and weatherstripping along opening edges on doors and windows. Sealing drafts can also lower the chance of ice dams forming in gutters for even more protection! Homes with central heating can lose up to 20% of the air moving through the ducts. If they are poorly sealed or insulated, they can contribute to expensive energy bills. These ducts move through the walls, floors and ceilings, and if not sealed and insulated correctly, could be costing your hundreds of dolls a year on your heating bill. Call a qualified professional and make sure your duct system is working in optimal condition for big winter energy savings. 5. Clean your fireplace and chimney. Before using your fireplace, make sure it is clean and have it inspected on an annual basis. This will ensure it is free of contaminants like creosote that causes fires and keep your house safe. You should also keep the flue closed when not using the fireplace; it’s the same as keeping a window open otherwise, and your hot air will escape. Installing tempered glass doors and a heat-air exchange system will also circulate warm air back into the room, keeping your heating costs down. Slash your winter energy bills and save with PA Energy Ratings! By following these five steps you can prepare your home for winter and save on your electric bills. And if you’re looking for even cheaper rates on your electricity in Pennsylvania, you can head over to https://www.paenergyratings.com/electricity-rates to learn more and compare plans right now.